The Cirque Du Soleil - La Nouba show at Downtown Disney West Side first opened in late 1998. From 2007 it has had competition from the rival Blue Man Group show over at Universal CityWalk. Do not be confused by the name "circus". This is not about lion tamers and performing elephants. This is a high energy, avant-garde circus style performance featuring acrobats, gymnasts, jugglers, dancers and other entertainers such as Pierrot clowns and incredible diabolos performers. Whilst it will not appeal to everyone, it combines amazing circus performances with spectacular theatre, dramatic lighting and dazzling costumes, accompanied by a live sound track from a small group of musicians and singers. There are over 60 artistes in total and they represent two distinct groups of performers, the "Cirques" (circus people) dressed in distinctive colourful circus apparel and the drab Urbains (urbanites) in monochrome blacks, greys and muted colours. Cirque Du Soleil is located on the West Side of Downtown Disney. The custom built white tent-shaped theatre is 160 feet high with a floor space of 70,000 square feet and a seating capacity of around 1670. 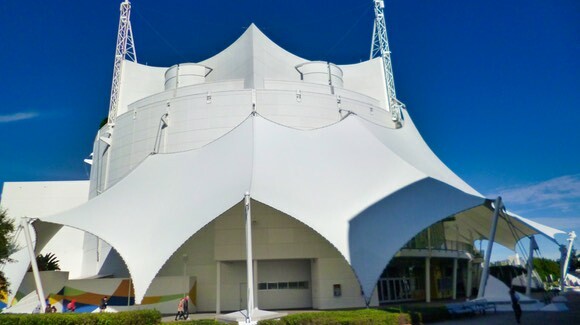 It is designed to look like the travelling Cirque Du Soleil show's "Grand Chapiteau" big-top tent. Note parking is free at Downtown Disney and section 4 is the nearest to the theatre. There are two shows a day at 6:00 pm and 9:00 pm, Tuesday through Saturday lasting approximately 90 minutes without an intermission. You need to arrive at least 30 minutes before show time to get seated and enjoy the pre-show. If you arrive too late you may find your seat has been re-sold. There are no shows on Sundays or Mondays and there are also a few blackout dates. Blackout dates for 2011 are January 18-22, March 22, May 17-28, July 26, September 20-24 and November 22. Whilst there is no formal dress code, many of the audience like to make an effort to dress more formerly, as if they were going to a normal theatre. Food is not permitted in the theatre but there is a snack bar and a gift shop. As an alternative to Cirque du Soleil La Nouba there is also Universal's Blue Man Group show and a number of dinner shows in Florida, particularly in the Orlando area. The seating inside the theatre is split into four main price zones. Prices start at $71 for an adult and vary according to position. The most expensive centre stage tickets are $124. Note that prices exclude live entertainment taxes and service fees. There are no bad locations but the more you pay, the better the view/experience as you tend to be seated more towards front and centre stage. There are also locations for people with special needs. Children between the ages of 3 and 9 can purchase a child ticket and children under the age of 3 are admitted for free as long as they sit on a parent's lap. Tickets are non-transferable and can be purchased up to six months in advance. Most of the shows sell out well in advance but sometimes it is possible to buy tickets at the Box Office on the night. You can also buy tickets online through a number of ticket agencies including Disney themselves. The Cirque du Soleil show originated in Montreal, Canada and today there are around 10 permanent shows like the one in Orlando plus other touring shows all over the world. Cirque du Soleil shows often tour major cities in Florida including the St. Pete Times Forum in Tampa, Jacksonville Veterans Memorial Arena in Jacksonville, Bank Atlantic Center in Sunrise (near Ft. Lauderdale), Germain Arena in Estero (near Ft. Myers/Naples) and the American Airlines Arena in Miami. "Cirque Du Soleil" is French for "Circus of the Sun" and "La Nouba" comes from "Faire La Nouba" which means to party or to live it up.